Dating back to the 6th century, the Basset Hound is a unique breed of ‘low-set’ dog with enduring popularity. The face of Hush Puppy shoes, the Basset’s distinctive appearance is recognised globally, despite having evolved greatly over the centuries. Because of this, the Basset is now a breed of huge controversy as today’s Basset is a far cry from the earlier examples. The modern-day Basset can be traced back to the Benedictine Abbey of St. Hubert where basset-type dogs were first being bred. St. Hubert was a French nobleman and keen huntsman who converted to Christianity after seeing a divine vision of a stag while out hunting. The dogs he originally bred are believed to have descended from ancient Greek Laconian hounds, an old type of scent hound with a large and low build. St. Hubert’s original intention was to develop a strong, able-bodied hunting dog that could scale huge estates without tiring. The Basset Hound’s long-legged cousin, the Bloodhound, was the result of these breeding efforts and it is possible that the shorter-legged Basset was a mutation in the strain, producing a dwarf dog that was then re-developed as a curiosity. 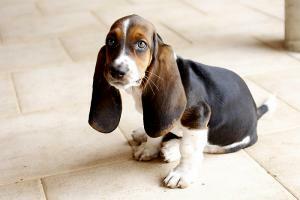 The first use of the name ‘Basset’ from the French word ‘bas’ meaning ‘low,’ appeared in a 16th century text. From then on, the Basset Hound was an established breed and a popular choice amongst French nobility. This was to the detriment of the breed with the onset of the Revolution as many dogs associated with the aristocracy were slaughtered. Following the French Revolution, the Basset Hound became the pack hunting dog of commoners as they needed a slower dog they could easily trail on foot, not having the luxury of horses. Before the Revolution, hunting on horseback was the preserve of royalty and the shorter-legged Basset that lacked speed and agility wasn’t suited to the role. That said, the Basset wasn’t entirely without value. Its low-to-the-ground nose lent itself tremendously to scent hunting and its size meant it could manoeuvre into the smallest spaces and hunt through bracken without getting injured. Its relatively loose skin also facilitated this well and enabled the Basset to get about without harm. The breed maintained its popularity during the reign of Napoleon, who personally enjoyed the Basset and had his animals sculpted in bronze and exhibited at the Paris Salon. Although it was still widely used as a hunting dog, the Basset was progressively seen as a companion animal and was recognised for its calm and obedient temperament. The first Basset hounds were imported to England in 1866 by Lord Galway, although the breed still remained relatively unknown here for some years. Fortunately for the Basset, in 1874, Sir Everett Millais – otherwise known as the ‘father of the breed’ – began a breeding program at his kennels. After exhibiting a Basset in 1875 and again at the Wolverhampton show in 1880, the public finally started taking notice and showing enthusiasm for the breed. - A 2008 BBC documentary Pedigree Dogs Exposed criticised the appearance and conformation of the Basset Hound, citing the numerous ways it has been selectively bred over the years, resulting in a number of genetic abnormalities. Other dogs that came under the firing line included the Cavalier King Charles Spaniel, the Boxer and the Bulldog. - Despite being relatively small dogs, Basset Hounds are heavy dogs, weighing in at roughly 50-65 lbs. - Celebrities love the Basset Hound - famous figures including Elvis Presley, George Washington, Marilyn Monroe and Clint Eastwood are just some of the many celebs to have owned a Basset.